"Let's try to cook more dishes than last time!" Last time, we served eleven dishes in a tapas style roll out, impromptu. 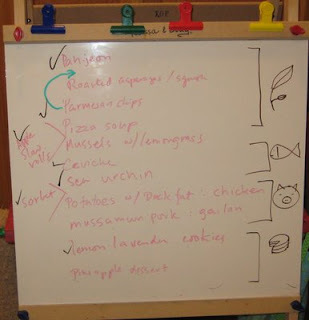 This time we were a bit more organized, as having a whiteboard written menu be a guiding game plan. The dinner was divided into a series of "courses", each one rolling out in turn. 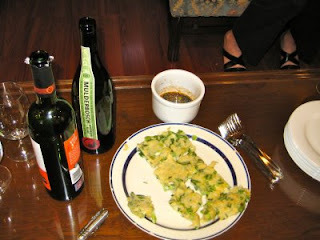 #1 As people arrived, we started out with pieces of pah-jeon - Korean scallion pancake. Actually, pahjeon is pretty straightforward, and malleable to different regional interpretations. The version we made came from egg, a bit of flour, cold water, salt, cayenne pepper, and a lot of chopped scallions. 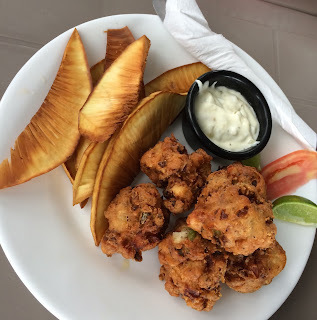 The pancake was cut into rustic serving pieces, and served with a dipping sauce prepared from raw garlic, soy, vinegar, sesame oil, chili powder, and a pinch of sugar.